Sabarmati Ashram, formerly known as 'Satyagraha Ashram", situated in Ahmedabad at the Kocharab Bungalow of Jivanlal Desai, a barrister. Later on, it was shifted to the banks of Sabarmati river and then it came to be known as 'Sabarmati Ashram'. 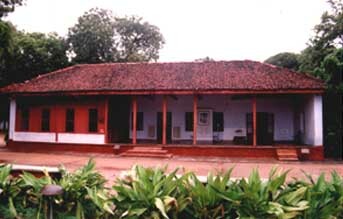 Gandhi stayed at the Ashram from 1915 to 1933 later on the Ashram was disbanded. The Ashram is a witness to many important historical events. The site of 36 acres was a wasteland full of snakes, but the order was not to kill them. The Satyagraha Ashram was founded on May 25, 1915, in Ahmedabad at Kochrab, when Gandhi returned from South Africa, with 25 inmates. The Ashram was shifted on the bank of river Sabarmati in July 1917. Devoted ashramites led a community life in search of Truth and Non-violence under his guidance. While at the Ashram, Gandhi formed a school that focused on manual labor, agriculture, and literacy to advance his efforts for self-sufficiency. It was also from here on the 12 March 1930 that Gandhi launched the famous Dandi march 241 miles from the Ashram (with 78 companions) in protest of the British Salt Law, which taxed Indian salt in an effort to promote sales of British salt in India. This mass awakening filled the British jails with 60 000 freedom fighters. Later the government seized their property, Gandhi, in sympathy with them, responded by asking the Government to forfeit the Ashram. Then Government, however, did not oblige. He had by now already decided on 22 July 1933 to disband the Ashram, which later became asserted place after the detention of many freedom fighters, and then some local citizens decided to preserve it. On 12 March 1930, he vowed that he would not return to the Ashram until India won independence. Although this was won on 15 August 1947, when India was declared a free nation, Gandhi was assassinated in January 1948 and never returned. Today, the Ashram serves as a source of inspiration and guidance and stands as a monument to Gandhi’s life mission and a testimony to others who have fought a similar struggle.